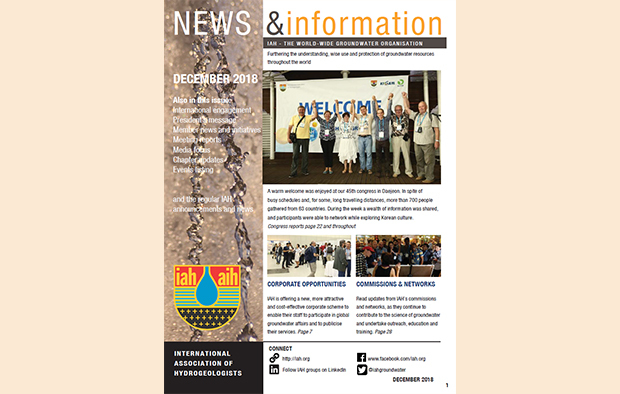 News and Information magazine is IAH’s newsletter, featuring news, updates and articles from the Association. News and Information is published 3 times a year. It is distributed as an insert in Hydrogeology Journal and is also published via IAH’s website and email alerts. It reaches all members and supporters of the International Association of Hydrogeologists – around 10000 people – and can also be freely downloaded by individuals worldwide for personal/not for profit use. Links to the most recent editions are given below. We are happy to consider possible news articles from our members and others in groundwater-related professions. We also accept commercial advertisements. Our current advertising rates are €300 per full-page advert and €200 per half page. These rates apply for one issue. If you take an advert in two successive issues then the third is offered free of charge. Corporate “red scheme” members and corporate gold sponsors of IAH are entitled to 50% off the quoted rates. All copy must be provided electronically. Copy dates are 1 March, 1 June and 1 October. Why not contact us now? Email info@iah.org for further information.